The days of playing rugby on a sodden, muddy and soaking wet natural grass pitch have now gone! In the UK, many new schools, sports clubs and councils are constructing new 3G synthetic all weather artificial rugby pitches that can be played and trained on in all weather conditions and even at night. 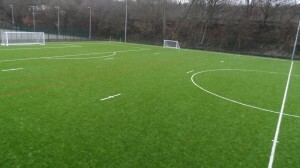 A rubber infilled 3G rugby pitch, which can also host Football, is a sports surface which is a minimum of 40mm thick and can take a moulded or plastic stud from a boot. The sports surfacing can be supplied and installed with any dimension size, with allowances for the different specifications, designs and budget requirements / funding. These multi use games areas or kickabout courts can also have sports fencing as sports floodlight installed as these can help to increase revenue from the facility as it allows the sports to be contained and also open for longer, generating income. The cost of this third generation rugby surface depends entirely on the design and specification which can be altered to suit many different budgets. The artificial 3G rugby turf is also available in different pile weights and heights including a 50mm and 60mm which will change the playing characteristics and shock absorbency of the synthetic grass. We also offer a monofilament and fibrillated third generation artificial rugby surface. We will be happy to discuss your individual project needs as required. Questions like funding, costings, prices and quotations can all be answered by using our contact form to submit an enquiry. « What Is A 3G Rugby Pitch?